Looking for that unique and chic item in colors that pop? Well, look no further because you found it! 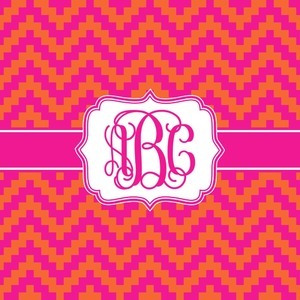 This super chic pixelated chevron print design is done in the popular hot pink and orange color combination. The pixelated chevron stripe pattern alternates between the hot pink and orange. The design has a classic ribbon in hot pink with white stripes. The decorative rectangular label is also in hot pink and white. The personalization is the gorgeous interlocking monogram in hot pink to pull the entire design together.